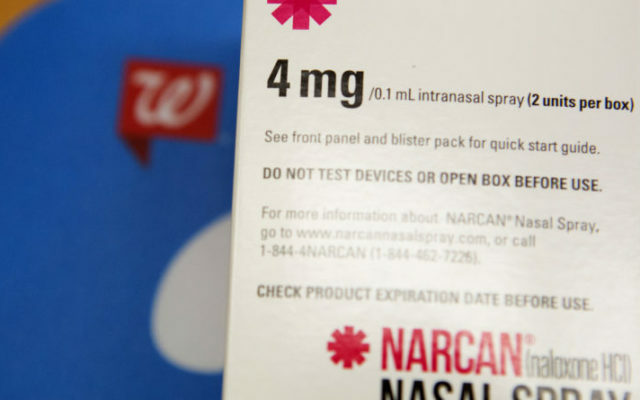 Ashley L. Conti | BDN A package of Narcan is seen at the Walgreens on Broadway in Bangor, July 20, 2017. Maine Gov. Janet Mills’ administration has announced a plan to place the opioid overdose reversal drug naloxone in “NaloxBoxes” around the state. The Portland Press Herald reports the boxes will be placed in public buildings, often near automated external defibrillator devices used to revive people in cardiac arrest. The state’s newly appointed director of opioid response, Gordon Smith, said Wednesday the boxes will also help decrease stigma and help people understand addiction is a chronic disease. The Mills administration currently distributes 35,000 doses of the overdose reversal drug, also known as Narcan. The attorney general’s office said there were 282 overdose deaths in the state in the first nine months of 2018. The majority of the deaths were linked to heroin, fentanyl and other opioids.